The Barking, East Ham & Ilford Advertiser, Upton Park and Dagenham Gazette - Saturday 28 January 1905 has a report of traffic on the Barking to Beckton Light Railway. Does anybody know anything about this railway? 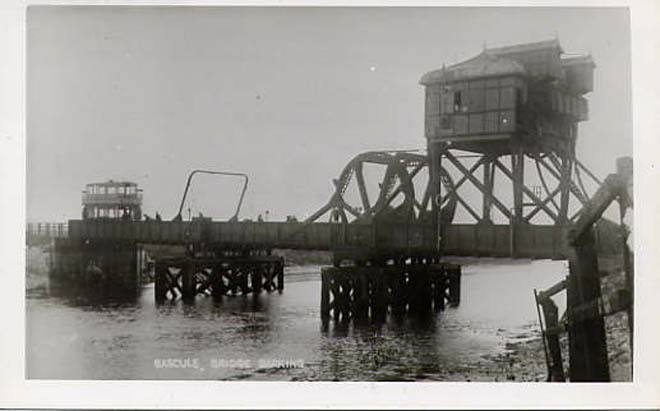 Now I know it was a tramway system as opposed to a railway system, I have been able to locate a photograph of a tram crossing the Barking Bascule Bridge. Mick you don't mention the location ,looking at the width of the river I would think it would be near the Townend of the Roding at Barking somewhere near the By pass crossing on the A13 . Further down stream towards Creekmouth the river widens . Interesting Item . Hello Ed, There was no indication as to the precise location of the bridge when I found the photograph. However I have now found a site that gives OS grid reference as well and when I click on the link, a map open up pointing directly at the current bridge at the Barking Road/London Road crossing. Biff, Many thanks for the link to the Ordnance Survey map showing the actual location of this bridge. It is much further south than had been shown on another website. Once the tram crossed the bridge into East Ham, it was virtually in the middle of a wilderness.